When Stephen Franklin and I were working on the series that came to be called Ricochet for MSNBC Originals, he would tell people we were interviewing that it was a six-part series. I told people it was a five-part series, because that was what it was meant to be originally. But part of one of the segments made more sense to be a separate piece, so we created it as a standalone story. Because I hate to admit I was wrong, here is part six of the five part series. 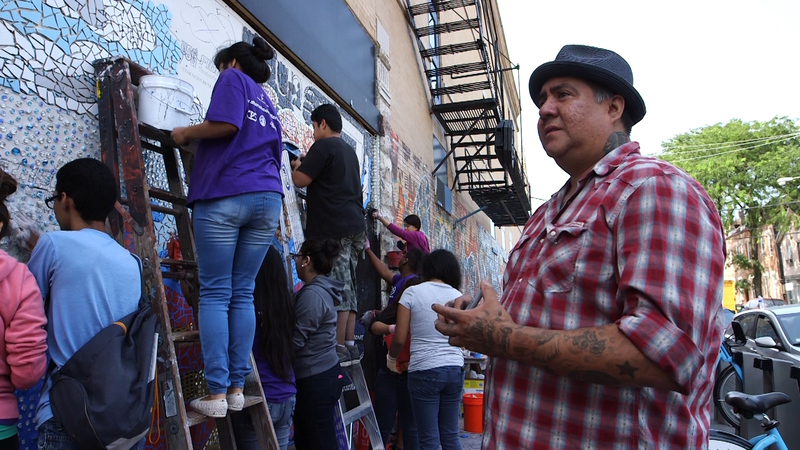 Artist Jeff Abbey Maldonado supervises teen artists as they complete work on a mural in the Pilsen neighborhood in Chicago. Kidding aside, this is released to coincide with the two-year anniversary of the Sandy Hook Elementary School murders in Newtown, Connecticut, when the parents of 20 children — and six staffers — had their normal changed forever. In reporting this series we met many families who are determined to turn their grief over a child lost to gun violence into a positive force. They are, as one parent said, part of an “unfortunate club.” In this story, we meet Jeff Maldonado, a father and artist who is using his creativity to build community in Pilsen in Chicago. And Rep. Robin Kelly meets with parents, and explains why she no longer stands when Congress holds moments of silence for the victims of mass shootings.